Well-bred and trained, seasoned pointing, flushing and retrieving dogs are essential for a fantastic and memorable plantation quail hunt. No way around it, everything centers around the gundogs. First the pointing dogs’ ability to locate and accurately pin birds for the gun; then for the flushing/retrieving dogs to get them in the air and to retrieve the shot birds quickly to hand, having marked their fall. And they must do it all with class! We are proud of our English Setters, Pointers, GSPs, Labrador Retrievers and English Cocker Spaniels. 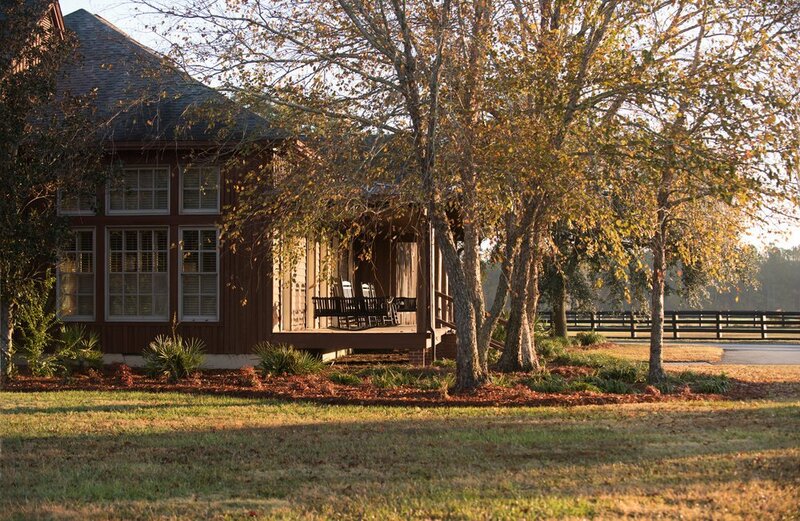 They are at the heart of Shadow Oak Plantation’s quail hunting. Their talent, determination, enthusiasm and athleticism adds a thrill to every hunt for their elusive prey, the Bobwhite quail. And when the dogs are not busy doing their jobs, they are affectionate and looking for that pat on the head or biscuit that says “well done”! Most famous of all, Butch’s English Setter Shadow Oak Bo rocked the field trial world with his back-to-back wins of the most coveted of all, the National Bird Dog Championship in 2013 and again in 2014! No setter had won the grueling three-hour endurance stake held on the Ames Plantation in Grand Junction, TN in 43 years. And no Setter had won back-to-back since the great female Llewellin Sioux won in 1901 and 1902. Bo’s list of field trial championship wins also includes the 2011 Continental Open All-Age Championship run on the prestigious Dixie Plantation, Greenville, Florida. Retired in 2016, Bo now lives a life of luxury at Shadow Oak Plantation. No where else but at Shadow Oak Plantation can you shoot over the progeny of such a famous and illustrious champion as Shadow Oak Bo! His accomplishment was so noteworthy, he had a featured story in Dec/Jan 2015 issue of Garden & Gun magazine with his image adorning the cover. Shadow Oak Plantation’s “Trophy Room” located behind the bar in the great room of the lodge displays photographs, awards, engraved trophies and silver cups won by many of Butch’s great field trial champions. A lifetime spent around proven champion bird dogs sets a high standard for Butch, exemplified by the bird dogs at Shadow Oak Plantation. Come quail hunt with us this season! It’s been 43 years. But it was bound to happen, and it did when Shadow Oak Bo, setter phenom owned by B.G. “Butch” Houston of Nashville, Ga., and Dr. John Dorminy of Fitzgerald, Ga., and handled by Robin Gates, was named winner of the 114th running of the National Championship February 22 when Dr. Rick Carlisle announced the judge’s decision from the front porch of the Ames manor house in Grand Junction, Tenn.
Bo appeared in the fifth brace of the stake on an overcast Wednesday morning, scoring seven perfect finds in his three-hour bid, backing his bracemate three times, and finishing the three-hour marathon heat in commendable form, concluding his performance with his seventh find. Not since Johnny Crockett claimed the Grand Junction crown in 1970 has a setter prevailed in this stake, but Bo did it in “spades”. His steady, forward ground application for the three hours was impressive, and he punctuated that with commendable bird work, while also adding the finishing touch — backing his bracemate three times. From the 2014 Report of the National Championship that appeared in the American Field, March 8 issue. When Shadow Oak Bo won the National Championship in 2013 history was made — the first setter in 43 years to take the title at Ames Plantation. When his name was read by Dr. Carlisle as the winner of the 2014 renewal, history was again made. Not since Sioux back in 1901 and 1902 has a setter accomplished this feat, and the last pointer to do so was Paladin, in 1951 and 1952. To win the National Championship is considered to be the epitome of field trial success for an owner, the dog and handler. To win the National Championship twice by the same dog is a feat that owners and handlers can only dream of. Adjectives aplenty will fly regarding the white and orange setter’s phenomenal achievement — remarkable, outstanding, unbelievable — will all be used to describe what Shadow Oak Bo has accomplished in his career as an all-age competitor, and the same words will be used to describe the gamut of emotions for owners and handler of the new two-time National Champion. Bo appeared on Monday of the second week of competition, February 17, on the morning course, the same arrangement he had drawn in 2013. Conditions were similar in some respects — overcast skies and cool temperatures. His performance included seven stellar pieces of bird work, three in the first hour, two early in the second hour and two in the final hour to annex the Grand Junction title. Bo’s effort came closest to the Amesian Standard, the “yardstick,” so to speak, that is used when evaluating a dog’s performance as worthy of the title National Champion.